Beautiful fall weather we have been having. I love fall with the colors and sweaters to wear. Evening with hot beverages and sit by the fire place. I am posting an older layout that I did earlier this year before the store closed. It was never displayed. 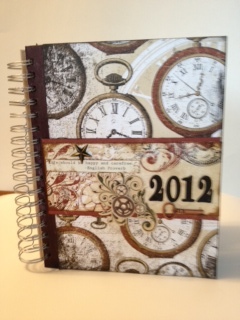 I used the Authentique Carefree line with a few chipboard elements from Teresa Collins Fabrications. It was the last time my youngest son, Alex would sing in the elementary chorus. Every year they had been invited to the Dragons minor leauge game to sing the national anthem. It was a very hot day and the Dragons were kind enough to let the kids stay behind the dugout in the air conditioning. It was a day of fun to be at the ball game. I took a break for a while to get ready for school and take are of family . Sometimes you need to just take a break. I was feeling a little burned out on making things. I really felt a little uninspired but starting to get back to wanting to scrap. I have cleaned out alot of my scrap stuff and organized. Amazing things you can find buried in the back of the drawer. In fact, I made something from the back of the drawer. Not sure where I aquired the metal words or how long I had them. Plus I had this box that I bought for another project but got dropped and the wood split on top. So, I happen to be in a store and saw some of those over priced decorated boxes that I love to look at. I hate spending money on stuff like that when I know it can be made for so much less. Then I happen to be going through my stamps and never knew how many I had till now. I found these Hero Art leaves stamps. So I spent a lovely rainy day ( and it was wonderful to see rain) making this box. I might add more to it later but for right now this is where its at. I used a combinatin of Tim Holtz Distress inks, coffee grounds, a few jewels and Stickles. I stained the metal words with Stazon inks.It looks alot lighter in the picture than what it is. Sorry it has been so long since last post but my mother has been ill and busy with kids activities. So hopefully since she is out of the hospital, I can find some time to scrap and blog.It finally rained here and now I hope for more rain. The grass has little green areas poping up among the brown crust. I thought I would post something I made a while ago from Teresa Collins Fabrications line. I have to admit, I was not in love at first with this paper at first but once I started playing with it.. then I really loved it. I think it had something to do with the patterns. I have the tendency to pick out what catches my eye first without thinking the whole concept through. Also, I have to admit that my son Alex also helped on this one. ( He loved all the papers in this line) He had this idea for the layout and we worked on it together. Alex is very open about what he likes/ dislikes and always loves to paint. He liked this picture because the stone stairs,which are at one of the parks we go to. Its one of his favorite trails to go on. I don't like these steps cause it is hard for me to go up them. They are very steep and rough. Everytime I make it up the steps, I feel like I accomplished something. So hopefully we will get more rain so we can get back to more of the lush green colors of spring. Its been a long week and today its Friday!! Still no rain, the grass is a bit crunchy and brown these days. Today, I am showing a book that I have started with my son, Steven. He runs cross country and track. This is his first year at high school, so this year we have a book to follow the races. I usually end up with a bunch of pictures at the end of the season and then try to figure what went each race. This year I am hoping it will be different. I got a Fancy Pants brag book. It has pages to write on like a diary and areas for pictures. The best thing it has pockets to put items in. So now I can put the race course maps, his number bib and any other things from the race in it. I used the Bo Bunny line Time piece for the cover. I thought the clocks was perfect since he races against the clock. Steven had used this paper when he did his 8h grade poject for English. They had to make a scrapbook on differnt times of his life, things he like to do, thoughts on parents ( that was very interesting to say the least) etc. On the cover of his book, he used the clock paper from a Teresa Collins line. The weather has cooled down alot.. Its almost livable outside.I can be outside for a while without dripping. I thought I would share oe of my favorite projects today. I used Authentique's Genuine line. It is the perfect paper for anyone who has boys. I love Authentique's papers. The paper is a nice weight that you can use for anything from scrapbooking to home decor. I used colored pencils and stickles to outline the flower and highlight the bud and butterfly. I used the Elements stickers through out the pages to describe my boys. They are each other's best friend and always look out for the other. I feel fortunate that they are so close even though they are 4 years apart. I hope everyone had a good holiday! Its been so hot here with the temps being over a 100 for the last couple of days. I am looking forward to this week with the drop in temperature to the 80's. Now we just need some rain. I have a couple of pages that I did recently from the Bo Bunny line Country Garden. I loved the butterflies and colors in this one. I just had got my son's pictures from school. The school has a spring picture day for fundraising. I did not know that it was picture day and Alex decided what to wear. He picked out one of his favorite tie dye shirts. He really likes anything tie dye. So in the end the pictures were cute and it was really was a reflection of his personality. Its actually his last year in elemnetary and this fall he goes to middle school. I will be back later to show you some more projects. In the mean time everyone stay cool! Have a wonderful creative day! Been another hot day here! The area could use some rain and a little less bugs. I have been busy re-arranging my scrap room. Amazing how much stuff one can collect. Its always an interesting experince especially when you find items that you forgot you had. Hopefully I will get everything organized soon. The last part of the book. I apologize for at least one set of pictures. I have not be able to find my memory card for my camera so I had to go with what I had. Hello! I was a designer for Simply Scrapbooks. I am married with two boys. I love to do photography and scrapbooking when ever I can.